Interview with Gennady Yevstafiev, retired Lieutenant General of the Russian Foreign Intelligence Service. The first test launch was basically successful. It is a great achievement of the Indian research technology and we have to admit that India has become one of the major missile countries in this world. And it was developed for a number of years. 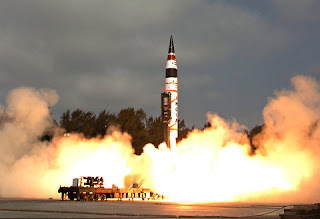 Initially the idea was to develop Agni-III into number IV and number V, but then number IV somehow has not been tested yet and now we have Agni-V. This is a formidable missile with the range of, some people say it is 5000 kilometers, but I’m afraid they are misleading the public opinion because there are people who believe that it has a potential of 8000 kilometers. And of course the range of throw is a classified information but nevertheless between 5000 and 8000, this makes it intercontinental strategic missile. The missile was coming under the Strategic Forces command. So, it is in a proper hands and it has been launched from a traditional place, there is a Wheeler Island where Defense Research and Development Organization of India has its sights. And it would take a number of test flights, not less than four or five, before a missile itself will become operational. Now it is a success but it is not yet operational and it will also take three or four years before they really develop what they say. They want to have at top of this missile MIRV system – Multiple Independently Targeted Vehicles with a number of, between two and ten, separately targeted nuclear bombs. And it will take some time, this technology is not yet ready. And what we have of course it is a huge missile, it is almost 18 meters, and its diameter is 2 meters, it is really a robust and solid mechanism. It can carry about 1500 kilos of weight of load and it is enough to carry a vessel with a nuclear bomb or to have four or five MIRV bombs which could present a very serious difficulty for missile defense. And we have to give credit to Indians, they have mastered, which has taken more time in bigger countries like the United States and Russia, they right from the beginning have put the missile into a canister which is sealed and the missile could be kept for quite some time before it is being thrown out from a canister and after that it starts moving. Of course we know the Indians have serious successes in navigational systems, in GPS systems that’s why as far as guidance is concerned that’s quite a reliable thing because the standard of Indian electronics and space technology evokes respect. So, having fired this missile Indians have stated by the firing test that they have joined the club of the great missile powers. Being the nuclear state they have declared that they have a very universal weapon for the future developments because of course they have their own threats perceptions and risks. And that’s why it has been done according to their view of developing situation. If you have a look on how far it can fly – it covers all China and it can come up to Europe. I wonder if these people in Europe, would they think about a threat from a third world country and what do they think about their missile defense system because it is much more developed than anything we have in Korea or in Iran for that matter. Indian researcher Bahukutumbi Raman says that Agni-V is, like he put it, a Chinese centric missile. And he says that once it is put on operation, it can reach those parts of Eastern China on which its economic prosperity depends. Now, if that is really so? Are we going to see something like arms race between China and India? The arms race between China and India is going on for the last 15-20 years. 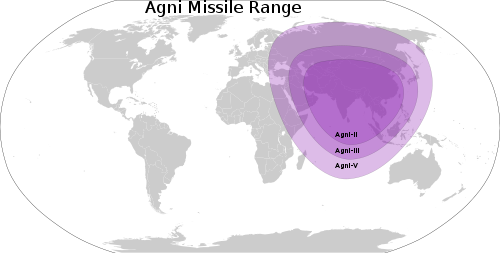 The range of Agni-V covers the whole of China, not only the areas on which the Chinese prosperity depends. In terms of Indian perception of threats of course in the Indian General Headquarters, among the military China is the major threat and that’s why they have found now, say by 2015 they will have a reliable weapon to respond to Chinese threat. But on the other hand I think it will make the whole situation, as far as stability is concerned, more predictable and both sides, I would say, would be very cautious about playing with muscles. But it is a certain warning to other countries around India, in the Indian Ocean and in other places that India has a potential and they have to deal with India very cautiously, they should not irritate India and it has Indian Ocean at her disposal because with this kind of missiles, they will have a number of them, they would control the whole area. And it happens, interestingly enough, it happens in times when Americans are trying to develop their assets and potential in Australia. And America is preparing for some sort of a showdown with China sooner or later. In this situation we have a new player, very important player who has got something to say. And is the player going to take sides in that situation? No, I don’t think India will take any sides in this because Indian policy is very mature. Indians know the border of their national interests and they won’t go a step over this border. They know the Chinese points of aim, so to say, which they should not step on. But in a long run I think it would play well in containing the United States. Yes, in the long run, especially if China and India would agree among themselves and would really divide the spheres of interests, it could be a very serious reminder to the United States that they have to behave in this area because they are not the only one country which possesses this kind of formidable arsenal of weapons. But interestingly enough India has close cooperation with the United States in nuclear matters. So, do you think that could be a leverage for the United States to apply some pressure to India? No, I don’t think so. You know, the agreement with Bush Administration signed with India about scientific cooperation, but mainly in a nuclear field, in 2007 is of the particular interest to the United States because they know the Indians have a huge energy program which is based mostly on, due to rather poor energy resources, it is based mostly on the development of the nuclear industry. We benefit from this idea of Indians develop nuclear industry, Kudankulam which we are going to convert into something very spectacular. But the Indian request is huge because Indians are planning within 20-25 years to build about 50 nuclear energy reactors and American industry which is not producing nuclear reactors now for the use in the United States, they have stopped producing them to the United States industry, they badly need some market for the advanced technologies in that. By the way, French are in the same boat, though of course French industry is of a much smaller size. That’s why the fight for Indian market in nuclear technology is basically a commercial fight for the share of Indian market. But the market is going to be so big that for the next 15 years there will be enough space for everybody to work on this market. Mind you that Indians are very serious customers and they demand a lot of set benefits when they sign agreements and these set benefits would of course sponsor the Indian industry in developing their own technologies. And sooner or later they will produce more than 50% of what they need for themselves. And now of course the final question based on your assessment. Just how good are the chances, the way you see, that eventually India and China might come to terms? Because now we’ve got more than half a century standing conflict between the two. And on the other hand there are so many forces which would be trying to prevent the two countries reaching any kind of agreement. That’s true. And for example America very cautiously but they do have the share of really provoking the rift between the two countries, but very carefully. They don’t want to be caught red handed. This is very difficult to predict but both countries are quite mature in their diplomacy and foreign policy. Both countries understand the level of their pretensions over the influence in this world and that’s why unless there is something very special, and very special in this case might be Pakistan which is an ally of China. But Indians are cautious with Pakistan, they don’t want to take upon themselves the burden of handling the affairs of this almost fail state and they really don’t mind the Chinese working there and having their share of influence in Pakistan. But on the other hand there is no serious problem of fighting for resources up to now between China and India because China is trying to master the situation in the Pacific Ocean zone, and especially on those islands like Paracel or on other kinds of isles, and these are the priorities for the Chinese. They don’t show much their flag in the Indian Ocean. From time to time they come but just to show that there is the Chinese Fleet and so on. But they understand and they see that the Indian Ocean is the zone of influence of India, and they don’t provoke India for all kinds of responses. The same thing with India, it is quite far from this Pacific Ocean area. It has a lot of things to do around the Indian Ocean and that’s why they are not a competitor for Chinese in the area. Whereas the United States, Japan, maybe even Indonesia, Vietnam, these countries are more anti-Chinese in a sense that they are afraid of Chinese, they don’t want to have the increased Chinese influence. And that brings me to some sort of a hope that understanding this Chinese and Indians, especially in times of possible Chinese-American tensions, they would keep quite good relationships among themselves. Well, let’s hope so. Though there is the painful issue of Tibet. Tibet of course is a point of disagreement but with the course, the way things develop, Indians will soon be deprived of their hope to have something in Tibet which would be more favourable to their heart then what is now. Chinese are moving there slowly but I would say resolutely and I don’t think Tibet is having some chance of independence. And what about the new port which the Chinese are building in Pakistan? Pakistan is a different thing. And Pakistan basically strategically is surviving on the strategic partner agreement with China. But times change. I believe that Pakistan in many respects is a fail state. And Indians do understand this and they don’t want to touch Pakistan in terms of military invasion. But still, are the Chinese interested in getting the port and getting access into the Indian Ocean ultimately? Not now. Time will come but now they have different priorities. I think they have a priority of China Sea oil resources and in the surrounding countries. In American opposition to this, they have the priority of Taiwan, deciding the future of Taiwan in some way which would be acceptable and they are very flexible on the way how to decide. So, for the next 15-29 China has enough to do in this area and if it is not going to provoke anybody on the other side of their borders, and they would prefer to have some sort of détente with India, this will work. Mr. Yevstafiev thank you so much. Yekaterina Kudashkina is the author and presenter at the Voice of Russia, Russia’s first internationally broadcasted Radio. On air since 1929.